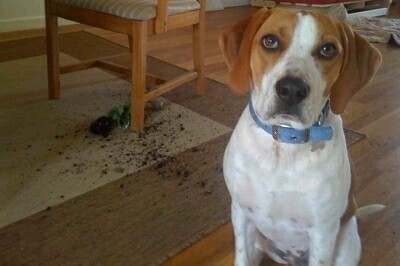 Darley the Beagle mix—"I had the kitchen door open trying to get fresh air into the house and she must have attacked a potted plant outside and brought it in while I wasn't looking." 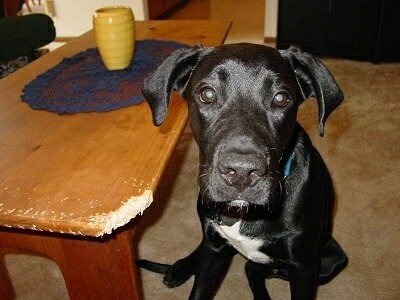 "This is Sully, our 11-month-old Lab / Pit mix. We came home from work one day to find him lying next to the couch, looking at us as if he is saying, ’This will teach you to leave me alone!’ Apparently all the toys and chew toys were not enough fun." 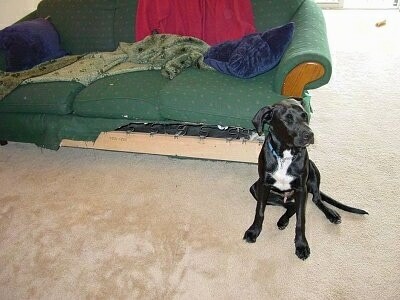 "While we were out, our Boxer puppy Lola, 8 months old, and our Chocolate Lab Ellie, 7 months, ate our entire couch! At least they were kind enough to pose for a picture." "Our first Christmas with Duke the Olde English Bulldogge. He found and shredded a brand-new package of tinsel. I guess he thought that our carpet needed some sprucing up! 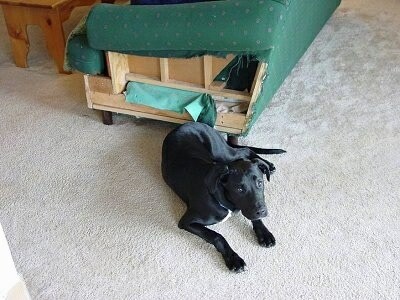 About 1 ½ years at this time, Duke did, and still does, love to chew anything soft or fuzzy. Or shiny, evidently!" "What? What did I do??? Do you mean this shiny stuff? It wasn’t me!" Freya the Newfypoo (Newfoundland / Poodle mix breed) puppy at 4 months old caught in the act of mistaking the couch for her chew toy. Freya the Newfypoo (Newfoundland / Poodle hybrid) puppy at 4 months old. "Careful Freya, there is a couch under your toy!" "The couch had to be thrown out." "These two pics were taken of our little boy Deek, my Goldendoodle. I couldn't figure out why I wasn't getting any strawberries from my plants...now I know where they were disappearing to. He also likes to eat my crabapples!" "These pictures are of Cricket, a 4-year-old Springer Spaniel / Pit Bull mix (Springer Pit) we adopted from the Humane Society. I took these pictures of her while we were at our friend's house. At our house when the bag of food is empty she tries to crawl in and lick up the crumbs. Well, this time—jackpot! She found a bag full of food!"